This epigraph condenses the original poetic key of the artist. The son of Italian immigrants, Grippo explored the fated landscape, extracted the symbolic aspects of food and nutrients, faithful to the legacy of his grandfather who knew how to be a miner, a railroad and a farm worker - that is, an ancestral example of the extraction of matter from Nature, the expertise in transforming this extraction to energy through the machine and the creation of new products through work. Perhaps the work Sí­ntesis (1972) is the product of this investigation. His creations reveal a slow digestion of this entire process. In Analogí­a I (1970/71) and other versions of the series, Grippo exercises, based on the generation of electricity, the energy source of a group of potatoes which he links by electrodes to a volimeter. The accompanying text likens this basic American food to the energy represented by the freedom of consciousness. It refers to the mental powers and powers of well-fed people to act, while presupposing the contrary: when food is scarce, hunger will unfailingly consume any energy remaining, resulting in immobility. The photographic material documenting Construcción de un horno popular para hacer pan (1972) is presented, in conjunction with Jorge Gamarra and the rural worker A. Rossi, taking place in the Roberto Arlt square as part of the Arte e Ideologí­a en el CAYC al aire libre exhibition which was subsequently closed by the police. This was the beginning of his research on work tools, Algunos oficios (1976) being the site of investigation. These gave way to his suitcase series - for example, Valija de panadero (Homenaje a Marcel Duchamp) in 1977- that subsequently changes to a series on boxes where he introduces roses and lead as investigative materials, as in Resurrexit (1979). These elements of a high symbolic content are utilized time and time again with different associations; vitality and spirituality in the former and death and inertia in the latter, where tragedy is course during the "years of lead", an unmasked reference to the last military dictatorship in Argentina (1976-1983). In this sense, a key is to be found in his work Vida, Muerte, Resurrección (1980), in which four pairs of geometric shapes made of lead are grouped together, four being perfectly-formed and four filled with beans, moistened in order to begin their process of germination. With the passage of time they will bring pressure to bear on the shapes and cause them to explode. There was a specially-built version for this exhibition representing the allegory exalting the power of vital energy and the transforming power of humanity - forces standing in opposition to its restraining forces. Alchemistry and the notion of transmutation are basic to his artistic practice and the manipulation of metals, which are also his means of livelihood as a jeweler and goldsmith. Grippo selects lead from among the base metals and the golden tones he applies to some of his works referencing gold, the "noble metal". Fire and its dual condition of purifier and destroyer forms part of his exhibit Frate Focu (Brother Fire), in which Ni viva, ni muerta, ni triste, ni alegre (1983) is outstanding. 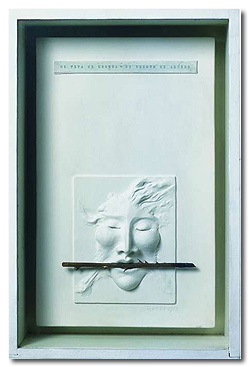 He places a human face in bas-relief inside a box, eyes closed and holding a rose stalk between the teeth. Among the few examples of his work with the human figure - he will later work with the diminutive figures of Juego de niños - where he introduces the semblance of a face emerging from matter, taking shape and acquiring depth. The face, somewhere between mask and shroud, as the volumetric impression of an indefinite state of being; dry rose stalks held in the mouth stand in for the cry for the days when Argentina recovered democracy. The stalk remains as the stamp of continuity as the signifier although it is no longer made of lead, its symbolic/military weight losing force at that time. Grippo represents a woman in no state which it is possible to describe. An ambiguous state, eyes closed but without being dead, the expression solemn without being sad, which explores the representation of a subject at the moment of transformation. The table is one of the everyday objects Grippo has frequently worked with throughout his life. Tabla (1978) reveals, as archeological, the messages which tell his own history on its surface "to reflect on the artist’s diet which includes both burnt corn and a golden egg " La comida del artista Puerta amplia - Mesa estrecha) (1991), or to display texts from different sources, such as scientific manuals, alchemical writings, hermetic poetry and his own texts on themes related to his iconography. He continued this type of introspection and inscription on tables he acquired from a school during an exhibition at the Havana Biennial - Mesas de trabajo y reflexión (1994).